Several things became very clear this time around with Nicole. And in hindsight, its really just common sense and how great would it be if more horse owners, trainers or anyone involved with horses would change their thought process? I know, wishful thinking. 1. It is so very important that we communicate and show the horse what we are looking to accomplish in a way the horse understands. This doesn’t mean using whips, spurs or any other contraptions to force them to do what YOU want. The only thing they understand about that is that it’s painful and it scares them. Be Soft!! For instance, when I’m teaching Pax some flexion and balance exercises in-hand like a shoulder-in on the wall, I am very careful to act very lightly in an ‘upwards’ motion with my inside rein so I act on the back of the mouth, not the bars of his jaw with the bit. I release the inside rein slightly when he is in self-carriage, and the release is what he understands to let him know he is doing it correctly. I keep a soft, but firm outside rein to help him support his outside shoulder. 2. Give the horse a chance and set it up as best as possible for it to succeed. Even if it’s just one step at a time. Give the horse a break. And PRAISE the horse for doing that tiny thing correctly! 3. Don’t ask the horse to do things it is not ready for. The horse has to be ready mentally and physically. 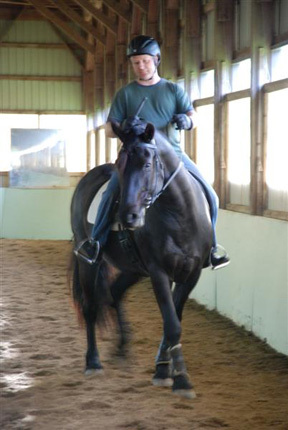 The horse needs to be balanced and the muscles the horse doesn’t typically use, need to be gradually strengthened. Using the same example as the shoulder-in along the wall in-hand, I’m asking Pax to carry himself and use muscles he generally doesn’t use much day to day. So I give him lots of breaks, letting him extend his neck before asking for the exercise again. And the entire session may only last 5 or 10mins. As he gets stronger and more balanced, the session time will increase. 4. Get rid of your own agenda when educating your horse. Lower your expectations and you will reach your expectations sooner.